The streets at NYFW Spring 2013 were filled with chic chambray shirts, an unexpected but intriguing look I plan on emulating in my own life. From models to editors, chambray blouses paired with sassy skirts never looked better. From light washed denim to sassy and sleeveless, when it comes to chambray shirts the possibilities are endless. Pair a buttoned up denim blouse with a pattern knee length skirt to take the trend to the office, mix a sleeveless denim blouse with a little leather skirt for a date, or go for a full blown sequin skirt with your chambray blouse of choice to wow at a cocktail party. How ever you decide to style this daring combo, you are sure to look like a fashion innovator. 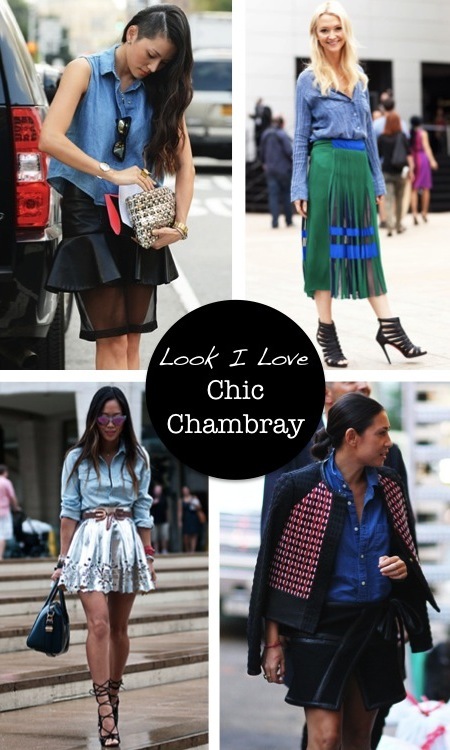 Ooh I love chambray :) My favorite look is the third one. That skirt is just fabulous and so feminine. I love chambray! Very cute post all I need now is a leather skirt! I'm wearing my Madewell chambray with a skirt today. It's one of my favorite looks! I love chambray! Cannot choose just one! Denim shirts look so good with so many things : ) Great pictures. i need some chambray in my life <3 i've been looking for a good shirt for over a year now! am so obsessed with chambray... got my own this summer - i think it's been my favorite purchase all year! I Love this, so cool! Check out my blog for the Lady Gaga's Fame giveaway! Want to try it! Thanks a lot for inspiration!!! 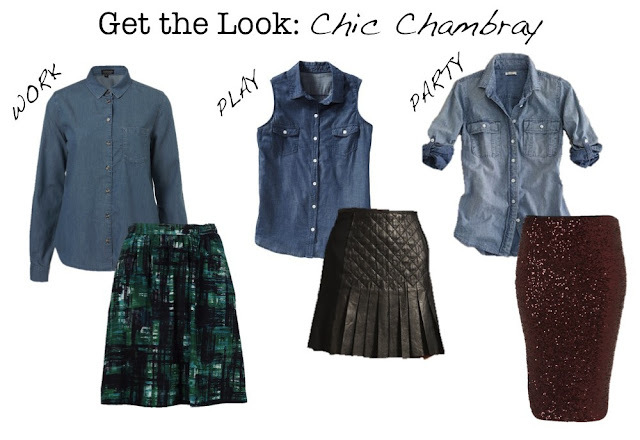 i think i can wear chambray with everything! I LOVE chambray shirts - And damn, I am loving the idea of pairing it with that sequin Top Shop number - That is RAD! By the way have a nice day! Love the 3rd look, that skirt is amazing. I love chambray! It really is a look that can go from day to night! ooh, what a great post? i'm crazy about chambray shirts these days!! following you now love, i'd love to hear what you think of my latest post, if you get a sec! I will be sporting a lot of chambray this season! This gives me a new prospective on chambray shirts! Thanks! great helpful post! I began following you with GFC and FB! Would love for you to follow me back! Love chambray shirts...sort of have a problem with them. Can't buy anymore. It's got to stop!